Who could resist this ERA Products heavy-duty Newport chair? Certainly, no one who’s big and tall, and who values their comfort. If you wanted to, you could work round the clock in this chair – it’s rated for 24/7 use, and a capacity of 500 pounds. It features a heavily padded seat and backrest, a seat slider for depth adjustment, heavy duty rocker recline mechanism, built-in four-way adjustable lumbar support, and all the standard features you want in your office chair. You’ll enjoy pneumatic seat adjustment, pneumatic seat adjustment, and 360-degree swivel. You’ll also have no trouble getting in and out of this chair, with the flip-up padded armrests. And when it comes to style, the Newport delivers with a range of choices including fabric, vinyl, and leather with mock leather trim. There’s also a full leather model available. Style, comfort, and a lifetime warranty – does it get any better? We didn’t think so. Other features of the Newport chair include plush foam padded seat and backrest cushions, built in 2-way adjustable lumbar support, seat slider for seat depth adjustments, heavy duty rocker reclining mechanism, tilt with tilt tension adjustment, pneumatic seat height adjustment, 360-degree swivel, flip up leather padded armrest for easy entry/exit, optional height/width adjustable task arms also available, heavy-duty aluminum base in your choice of chrome or black finish, optional all steel 30 inch base upgrade available, heavy duty all steel frame nylon casters standard. Hard surface casters available at no additional charge. 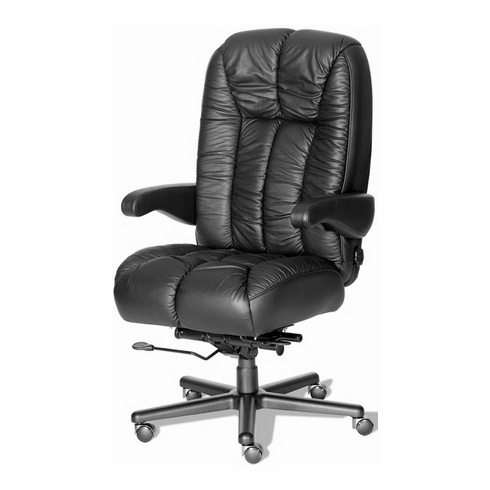 The Newport heavy duty plush office chair was designed by a leading auto interior manufacturer. Every ERA office chair is handcrafted in the USA. The Newport chair meets or exceeds ANSI/BIFMA standards. ERA has set the standard for excellence add quality in heavy duty and big and tall office seating. For over 25 years ERA as developed custom seating for luxury vans, RV's and autos. Now, ERA is pleased to introduce their exceptional products into your home or office creating the most comfortable and supportive state-of-the-art seating. Choose from a variety of ERA big and tall executive chairs and heavy duty 24 hour dispatch chairs all available in a wide range of styles, sizes and upholstery options. Every ERA chair is constructed with a heavy-duty "Lifetime Warranted" steel frame and a high density foam overlay that will see you through your longest workdays. Purchase ERA office chairs at Office Chairs Unlimited and get our lowest price guarantee plus free shipping.